I had a heck of a time trying to get a good photo of this, so pardon the photo quality – it does not do this tart justice. This tasty confection is, indeed, extraordinary. Many thanks to Mary of Starting From Scratch for choosing it! Yes, folks, that’s a 25 pound of sugar. Things may be getting out of hand in the baking department. Master Chow looked after the pups and took them for a walk while I worked on the tart. When he got back, he asked: “You know that bag you gave me for their poop?” “Yes,” I said, immersed in my tart and a bit distracted. “Well, it had a hole in it,” he informed me, holding up his hand. I think the tart made up for the poop bag incident. 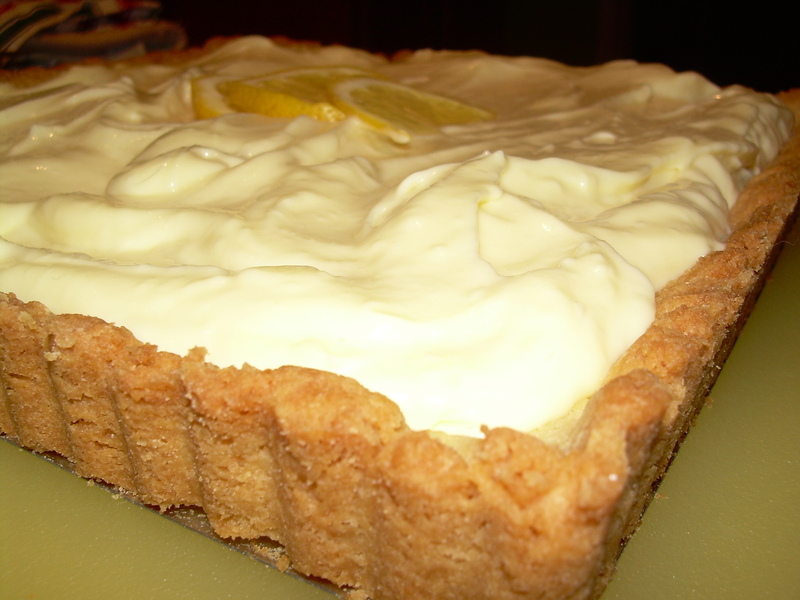 Master Chow raved about the tart, from the sweet shortbread crust to the creamy lemon filling. It must be served very cold, or all that butter starts to soften a bit too much. FYI, this entire dessert freezes very well. This is definitely on the repeat list, preferably when I have visitors who will help me consume a pound of butter. For the full recipe, please check out Starting from Scratch. For the full blogroll, and a chance to see the creativity that exists out there, check out Tuesdays with Dorie. Next week: Marshmallows, the choice of Judy of Judy’s Gross Eats. Update: some final thoughts. After reading the problems that other bakers were having getting the curd up to 180 F, I actually followed the directions (imagine that!) and used a metal bowl. My curd came up to temperature in about 7 minutes, so listen to Dorie, learn from our mistakes, and use a metal bowl! Second, I used a spatula instead of a whisk to make the cream. Finally, Dorie says that you don’t need to use pie weights because you freeze the crust before baking it, but I do both. I love the shape of your tart. Delicious! I felt like Ina Garten with all that butter in one recipe! Your tart looks exquisite, the square shape makes it look so fancy! I agree, it’s a must to repeat the recipe. Your tart is luscious! Your tart looks fabulous! I love that it’s square! Just perfect! first off – your website rocks! Glad your tart turned out well. Love the square! 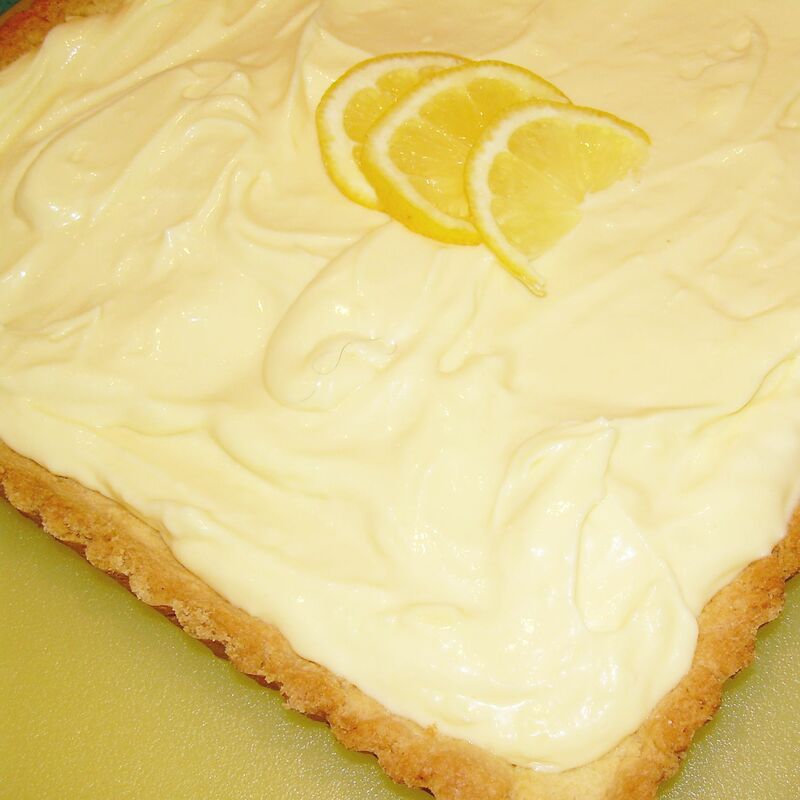 I love the square tart! It looks beautiful. I think your pics look great. And, amen on running low on baking items a little too fast…it is kind of a scarey thought. Good thing I just don’t think about it that much…! And I thought I was bad with my 5kg bag of powdered sugar…LOL! Your tart looks divine, good job, Madame! 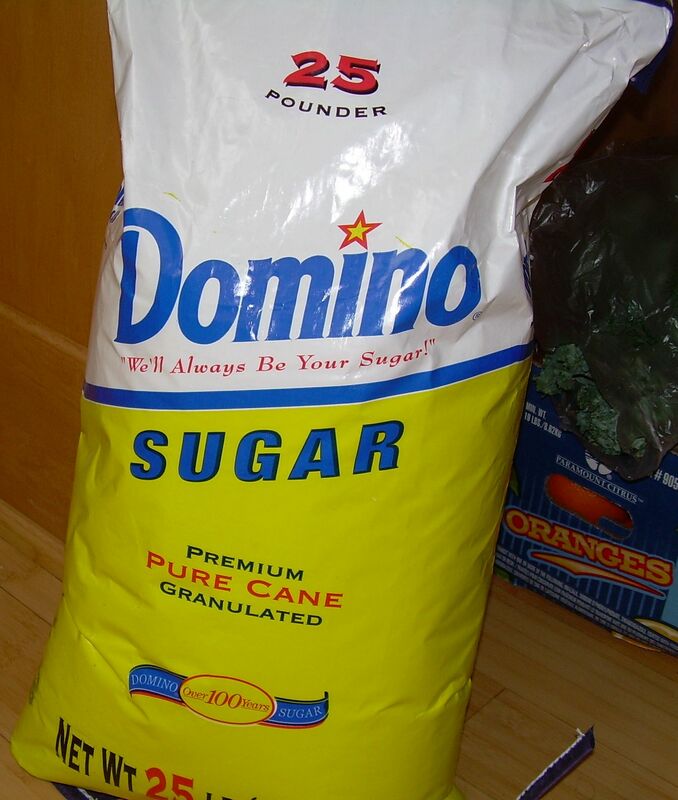 Wow – my boyfriend makes fun of my 10# bag of sugar! Your tart looks amazing! Looks gorgeous! I like the lemon slice garnish. And I’m with you on large quantities of baking supplies. I used to be able to keep a pound or two of butter around for awhile, but now I’m going to have to grit my teeth and buy twice as much each week. At least marshmallows are fat free. Yummy and lovely–your first photo made me want to dive right into those pillowy waves! And, I’m laughing at your sugar–I buy butter 4 pounds at a time! I giggled outloud at that bag of sugar. I didn’t know they made 25 pound bags! Your tart is beautiful! It looks huge! I love the square shape of your tart. It looks absolutely delicious! Nice job! The Paula Deen comment made me laugh. =) After I did that same calculation, I decide to only make half the recipe. I love your square tart pan! hole in the poop bag, dangerous! glad you were able to make it up with the tart though, yours looks smooth and creamy. and i am duly impressed with your 25lbs of pure white sugar! I feel your pain… I “invested” in twenty pounds of sugar this week, and I’ve been through more butter baking Dorie recipes than I care to admit publicly. Do you think we should start a support group? LOL at the Paula Deen comment. I felt the same way- definitely a tasty dessert but not one I should make often! I love the square shape. Great job! Your crust looks much better than mine… I think I should have cooked mine longer. Cracking up at the enormous bag of sugar. Looks great! I love the shape of your tart! It looks so tasty! Yum! Love the beautiful square tart! Looks terrific! Love the square tart! Yours looks so good! Wasn’t it delicious! I’d eat your tart in a second! Yum I love the look of your square tart! Good thing you had this delicious tart to make your husband feel better about the hole in the bag!